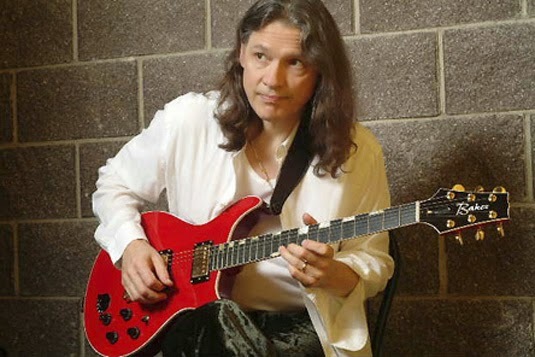 Robben Ford has played guitar with some of the greats. Joni Mitchell, George Harrison, and Miles Davis! Those names are legendary, but Robben Ford? Not so much. He is an extremely tasty guitarist with a long career behind him, and judging by his brand new CD he should have a long career ahead of him. But last Friday he came into Hamilton to offer a guitar masterclass to the students of Mohawk College, and he stuck around to play a concert at Mohawk’s McIntyre Theatre. Before long, Robben Ford, a youthful looking 62 years old, strode onto the stage. He was accompanied by a band composed of members of the Mohawk Music department teaching staff. Pat Collins on bass, Rob Somerville on trombone, Kevin Dempsey on drums and keyboardist Adrean Farrugia. They followed Ford’s nods and hand signals expertly through the show, only missing cues once or twice, but never to the detriment of the soloist. Ford played fiery soloes often trading with Farrugia on Hammond B3 or trombonist Somerville. Both teachers shone in Ford’s reflected glory, and it was clear that Robben enjoyed their efforts since he continued to offer them a second chorus. The rhythm section held their own too, providing a solid base for the soloists to weave throughout. A few numbers from A Day in Nashville, the new album, were mixed with selections from Ford’s past releases, but he could have been playing anything as familiarity with the music was not an issue. 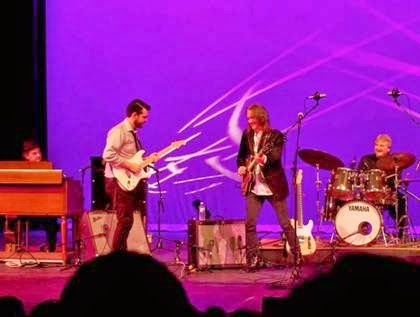 The essentials of blues (with a touch of jazz) are a solid rhythm section combined with some inspired soloing, and there was no shortage of that. Ford is just as advertised “one of the premier electric guitarists today…comfortable in a variety of musical contexts.” Late in the set he called out Bump City guitarist Braden Varcoe. Varcoe walked out on-stage carrying his Stratocaster and looking a bit sheepish. Ford called out for him to “take it” and Varcoe sent it back. No student wants to be compared to the master. But Ford insisted and Varco started slow, quietly noodling, but quickly turning the noodles into a feast fit for a king. 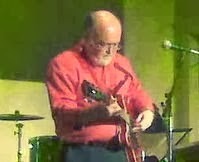 The two men traded off back and forth reaching new heights of excitement for the young guitarist, and putting a mile-wide smile on the master’s face. This interplay put smiles on the audience’s face too, the enthusiasm was contagious. Varcoe took his well-deserved bows, and left the stage feeling better than he had when he entered! The night ended after one encore and a satisfied crowd headed for the parking lot. One lucky raffle winner carried a brand new guitar, two others had signed posters, and me? I was happy to have heard the music, and been able to sit in the presence of one fine guitar master a remarkable disciple and a surprisingly sensitive supporting group, and a student band that rocked the joint. – David Kidney has reviewed for Green Man Review andSleeping Hedgehog. He published the Rylander Quarterly (a Ry Cooder-based newsletter) for 8 years before turning it into a blog, athttp://rylander-rylander.blogspot.com. He works at McMaster University as Director of Learning Space Development and lives in Dundas, Ontario with his wife.